Stay composed out on the pitch as you work on your skills and fitness for real competitive action with the Dry Squad Football Drill Top in Black and Black by Nike. This men's pullover training top from Nike features a quarter length zipped collar for ease of access and a custom fit. A soft and fleecy interior brings warmth and comfort ideal for chillier outdoor practice sessions and warm ups. 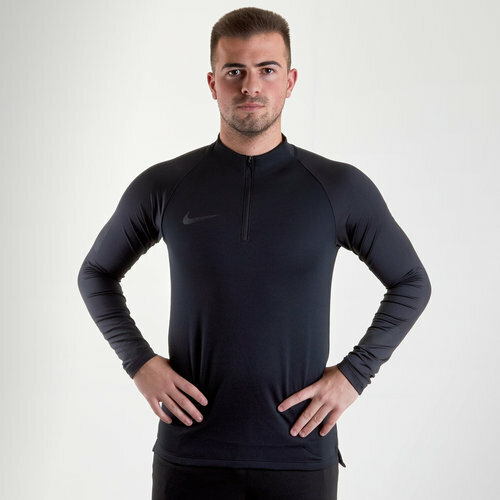 Made from polyester material, this training top features Nike Dri-Fit technology which is designed to help keep the wearer feeling drier and more refreshed during exercise by wicking sweat away from the skin and quickly drying off. Ventilated mesh strips on the sleeves ensures it doesn't get too stuffy inside and adds breathability. Ready for action in the gym or out on the field pull on for your next session the Nike Dry Squad Football Drill Top.